THIS IS AN OLDER POST. SOME OF THE SPECIFIC GIFTS AVAILABLE MAY NO LONGER BE SOLD, BUT WE STILL LOVE THESE MUSEUM GIFT SHOPS FOR GREAT GIFTS. If you are looking for gift ideas for kids outside of the offerings of your neighborhood toy store, look no further than a museum gift shop. Museum gift shops are a great place to find unique toys, books and games for kids that you won't find in any regular toy store and New York CIty is a Museum Gift Store shopper's paradise. Not only do we have the best museums (with the corresponding best gift shops), but some museums even have gift shop outposts completely separate from their museums, making it easier to pick up a gift without making a separate trip to the museum. Check out these cool museum shops that have great gift ideas for kids. One of my favorite things is birthday cake, especially from a box and double especially covered in frosting. I'm not a fan of all the fancy buttercream frostings and fancy cakes. I like regular old moist and fluffy chocolate or vanilla birthday cake slathered in rich, sweet frosting. But knowing that your cake is filled with hydrogenated oils and trans fats really takes the fun out of it. Especially as a mom. How can we enjoy stuffing our faces with cake when we know how bad it is for us? Thankfully, Nora Schultz, a New Jersey mom, has solved this problem with her Naturally Nora cake and frosting mixes, made from 100 percent natural ingredients. There are not even any artificial colors, flavors or preservatives. (The confetti cake is colored with things like spinach extract and turmeric!). They are also dairy and soy free. But most importantly, for me, Naturally Nora mixes contain no trans fats or hydrogenated oils. It's one of the most sought out topics on Mommy Poppins, birthday party ideas. Well, now we've got a page dedicated to everything we've ever written on the theme. And what's more, we're going to write about New York City birthday party ideas every day this week. So check out what we've got in our New York City Birthday Party Guide and stay tuned for more great posts about kids parties in New York to come. Oh, and while we've got your attention, make sure to check in next week because we're going to be giving away some awesome tickets to the top kid shows in New York City. Don't miss it. New York has changed a lot in our lifetimes. When I was a kid we really didn't have that many chains stores and restaurants in Manhattan. I used to see ads for Red Lobster and Beefsteak Charlie's on TV and pine for the suburbs. Now, of course, I know better and pine for the old neighborhood places. Most of them are long gone, but there are a few places left that have miraculously survived. You can take your kids to any one of these old-fashioned soda fountains and it's like stepping into a time travel machine. Each of these kid-friendly restaurants is a great place to stop by for ice cream drinks and desserts and is a window into a long-gone NYC. Experience old New York at an old-fashioned soda fountain. Isn't history yummy? Wednesday Quick Hits: 31 Awesome Cake Designs, Talking to your Child about Race, Extreme Weight Loss Measures, More! It’s almost Spring and hope is in the air! Right now there are so many fun birthday parties happening and we’re all emerging from our houses to go to them. If you’re one of the parents planning them, we’ve found 31 awesome cake designs you may be able to put together (ok, I wouldn’t be able to make them, but I have a friend or two who may). Also: tips on learning to talk to your child about race, the newest (very extreme) way to loose weight, Chris Brown trying to get the kids behind him and the best idea of the week. Go! On Halloween , the monsters take over the streets of NYC, but New York is always full of monsters, if you know where to look for them. 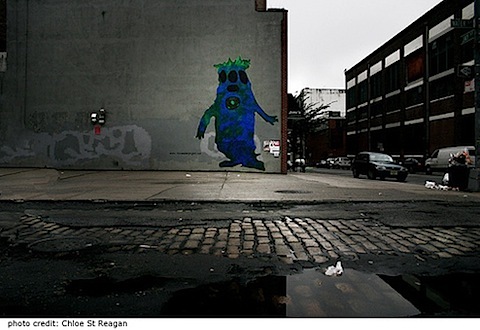 We've put together some cool ideas for finding monsters in NYC with kids. Perfect for a Halloween weekend outing or monstrously fun any time. Take advantage of the amazing fall weather this weekend with our pick of the best free outdoor kids events. Find out where you can hear They Might Be Giants, the coolest weekend activity for four-year-olds and why now is the time to hop on the Roosevelt Island tram. Plus, keep reading to get a special discount code for half price tickets to Goody Two Shoes kid-disco where you can party like it was 1999.